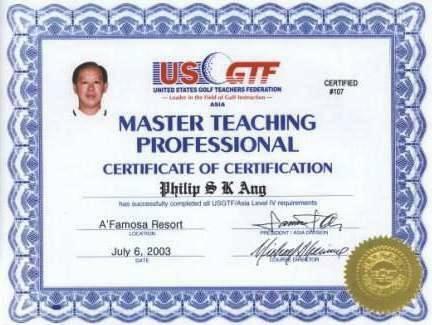 Philip Ang is conferred by World Golf Teachers Federation (WGTF) as top 100 teachers among their 25,000 certified golf teachers worldwide. The WGTF is owned by USGTF. 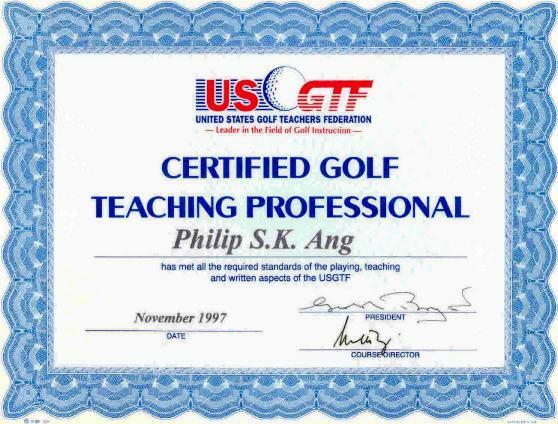 Philip Ang of Asian Golf Centre was awarded with a Cambridge International Diploma for Teachers and Trainers at professional level by Cambridge University International Examinations. He has achieved the international teaching standard specialising on golf teaching. This includes: pedagogy and andragogy of human learning characteristics and theories; behavourism, cognitivism, constructivism and humanism; learner learning styles and modalities; learners' learning intelligences and experiences; facilitating active learning methodology for golf skills acquisition; teaching by differential methods to matching learner's needs; providing opportunities and reinforcing with support for individual learner's needs; differential method of formative and summative assessments. Philip Ang was awarded distinction for the Design and Evaluation modules on golf learning, teaching, training, assessment and improvement. Associate Professor Dr Fabian Lim, PhD Head Military Physiology Lab, MSc (PE) MBA. Associate Professor Dr John Tan, PhD Physical Education and Sport Science NIE-NTU. Associate Professor Dr Patricia Wong, PhD Physical Education and Sport Science, NIE-NTU. Associate Professor Dr Steven Tan, PhD Physical Education and Sport Science NIE-NTU. Associate Professor Dr C Kunalan, PhD Physical Education and Sport Science NIE-NTU. Dr Micheal Koh, PhD Physical Education and Sport Science NIE-NTU. Dr Ian Harris Sujae, PhD Sport Biomechanics Human Movement, Technique & Performance. Mr Timothy Mak MS, ATC. Mr Edgar Tham, Psychologist (S'pore) MSPS, Sport Counselor (USA), BMNSP. Mr Koh Koon Teck, M.Ed (Pedagogy in Sport Coaching). Mr Gobinathan Nair, BSc(Hons), MSc, Human Nutrition. 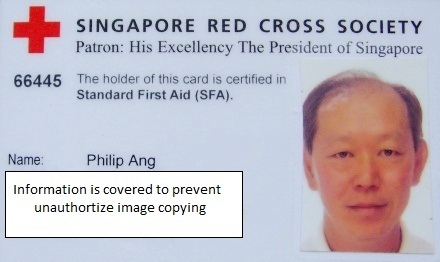 Philip Ang of Asian Golf Centre is a certified WSQ ACTA Trainer and Assessor by WDA for: Facilitated Training Programme; Prepare and Facilitate OJT Training Programme. He has achieved WDA required knowledge, skill and attitude through passing the WDA eight (8) modules of competency-based formal assessments. This includes the profound knowledge of: analysis, design, development, implementation and evaluation of curriculum; principles of adult learning; instructional design principles; instructional methods, phases and strategies; contextualisation to meet learner needs; design of active learning activities; develop and conduct competency-based assessment methods; evaluation of curriculum. WDA is a skill workforce qualification agency of the Singapore Ministry of Manpower. WSQ ACTA trainer's qualification is a mandatory requirement to conduct the WSQ approved curriculum. Philip was awarded golden pin for the completing the full training programme. Mr Christopter Yip, Mr Ramesh, Mr Mani, Mr Bonnie, Mr Richard Choo, Ms Ng Seok Cheng and Mr Stephen. 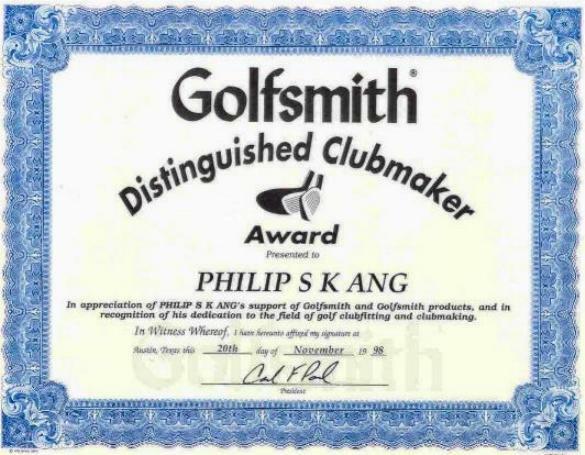 The American Board of Neuro-Linguistic Programming (NLP) - U.S.A.
Philip Ang is a certified: Professional; Advance and Accredited Clubmaker by Golfsmith International Inc., USA. His acquired knowledge and skills assist him to competently share with golfers the importance of playing with right golf equipment. The selection of correct equipment should comply to a golfer's ergonomics principles, swing characteristics and athletic ability. 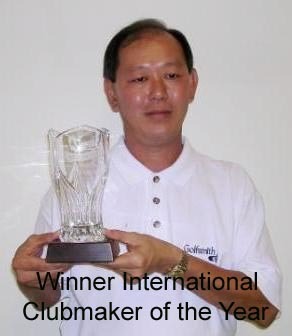 Philip Ang was conferred Winner International Clubmaker of the Year 1999/2000 by Golf Clubmakers Association (GCA) - USA. GCA has 30,000 members worldwide.